After designing your label and deciding on a size, pick the fabric you would like to have your labels made with. Some examples include Taffeta, Twill, Satin, and Damask for woven labels. Perhaps you’ll decide to have your labels printed. I’m sure that browsing through some of the web sites I’ve listed below will give you some creative inspiration! 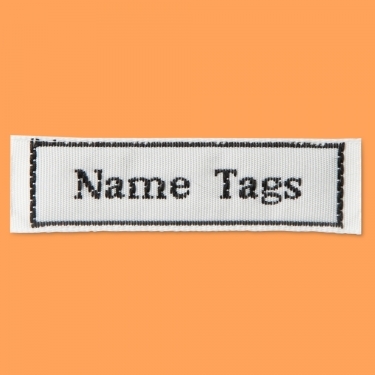 The company Name Label provides great labels for all your personal sewing needs. This company specializes in Short Run Woven Labels for designers, home hobbyists and soft toy manufacturers. They do Woven Labels in both Half Inch and One Inch widths and carry Printed Iron On Tags and Peel & Stick labels. They will also do designer woven labels with a minimum order of 500. This company makes basic and luxury woven clothing labels and 100% woven clothing labels. They will also make custom labels for all your sewing, quilting and knitting needs. Also available are iron on labels that are perfect for kids' school clothing and camp clothing, for example. They also provide personalized gift wrap, gift and address stickers, ribbons and wedding favors. This company will send you a Free Introduction Pack, which includes an assortment of printed and woven samples, coupons, and order forms with prices. Their labels are available on various types of fabric. They provide Sew On, Stick On and Iron On Labels.